You may already be using crystals in your kitchen! I believe this is why there is a current craze for granite countertops in kitchens! They are beautiful of course but also emit a measurable piezoelectric field which relaxes and restores us. Perhaps you'd like to know which crystals would suit your personal practice the best? Interested in creating success on your spiritual journey? Awaken your Akashic Records, develop your intuition, experience growth, and abundance! Why do people use crystals for healing and energy work? Crystal stores are becoming a more familiar sight in many towns and cities. Working with crystals for meditation or healing is becoming more common in modern spiritual practice. Why use crystals anyway – and if so, how should we go about it? In a double-blind study Dr Shealy was able to prove that 70% of people who departed from his depression treatment program with pre-programmed ‘positively charged’ quartz crystals were still out of depression at the end of three months, as opposed to 28% of those who had a ‘positively charged’ glass crystal as a control. How to use crystals for a beneficial spiritual practice? 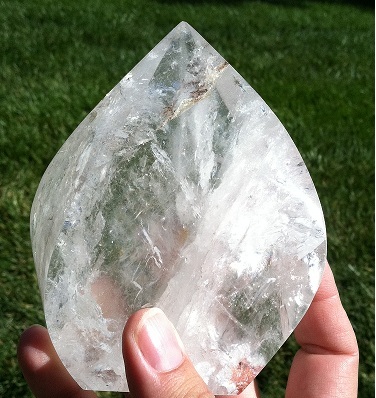 Because of quartz and other crystals’ unique structural properties, many people believe that when a current or energy is run through them, it resonates at a certain frequency helpful to the body or to a particular emotional or physical condition. So for example, rose quartz is often reputed to help with the heart chakra or heart center of the body. This is because it’s atomic structure and resonating quality is close to that of the heart area of the body. On the other hand, clear quartz resonates more closely with the frequencies of the higher brain or crown chakra so can be used to create more focus in meditation, for example. I use crystals to clean energy in a room, help pick myself up with an aura cleansing, and help others who need an energy shift. 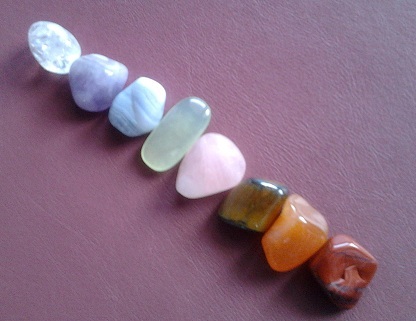 I also use different crystals for the individual chakras, or energy centers and practice chakra balancing too (see photo above). I gave my mum a crystal a few years ago (ametrine, a combination of amethyst and citrine, said to help with headaches). She slept with the ametrine by her bed and kept it with her when she was sick. She said that it helped her with headaches several times. If you have ever had the good fortune to travel to Yosemite National Park, the whole place is on a substructure of granite. It’s a beautiful and peaceful sensation to be at Yosemite. I recently traveled to Stone Mountain, near Atlanta, GA. There you can take a Skyride up the ‘world’s largest piece of exposed granite’. Many visitors are attracted to the location, because of the quiet peace and beauty there…maybe it’s the piezoelectrics too! It feels lovely to lay on the warm rock way above the world there. Crystals don’t have to be big or carved for you to gain a benefit from them. Some of my favorites are simple quartz in their naturally occurring form. To starting using crystals, find a store in your area. Just wander in and see what draws your eye or gives you a good feeling. Are you drawn to working with crystals? I can help you work more deeply this way with an Akashic Intuitive Coaching Session.